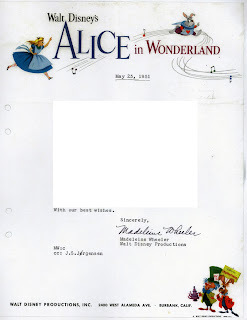 Ever wondered what a letter sent out from the Disney Studio in 1951 looked like? Well you don't have to wonder anymore. Here's a sample from May 25, 1951 signed by Madeleine Wheeler. Click to enlarge. Unfortunately I can't show you what she wrote since it's from a private family collection. But still, it's a nice item. I hope to see some of you in Angouléme soon. If you spot my name on my nametag don't hesitate to say hello! Don't miss Disney's B'rer Rabbit Hops Into the Funny Pages by Wade Sampson over at Mouse Planet! Some interesting reading about the weekly Uncle Remus comics. Got the new "Where's Dennis?" book from Fantagraphics yet? You should. It contains a treasure of old gag cartoons like this one from Collier's. It's actually from the very same issue as the cover I showed earlier. 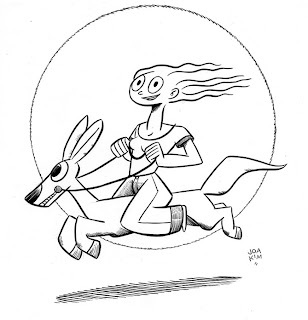 It appears in the book, but without color. Just a quick update saying that I've been and still is quite busy this week. Have lots of things to finish before leaving for Angouléme next wednesday. So all updates and e-mails that should have been sent just have had to wait. But hopefully I can bring you something interesting later this weekend. PS: Gerben: The package has arrived! Thank you!!! I'll write back to you soon! So many good things you sent! Wooha! Ever wondered what Goofy looked at two? Now both you and Glory Bee knows. Compare this strip to the 1943 ones I posted earlier. Same artist. 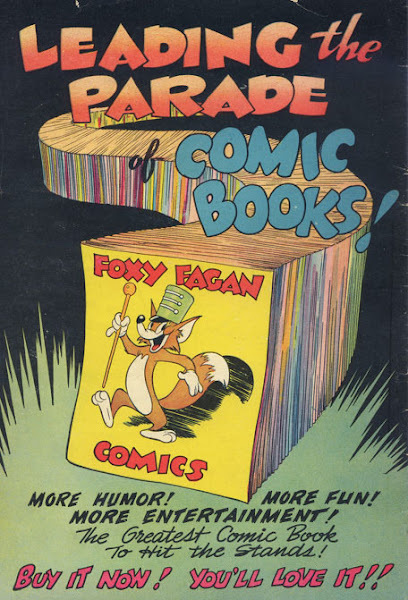 Floyd Gottfredson. Hard to believe, eh? This example is BTW for sale over at Galerie Laqua at the moment. PS: A warning about the movie "National treasure II". This is one of the worst movies ever when it comes to a plot that barely hangs together. It's actually funny in an non-comical way beacause it's so NOT logical and absolutely impossible. Like Indiana Jones meets McGyver that has watched too many episodes of CSI. We just laughed at the end when it just got too much. This is one of the few times I've seen the audience leaving the cinema because they couldn't stand it. "My guess is that this is a panel from a Johnny Hazard daily drawn before the strip actually began. 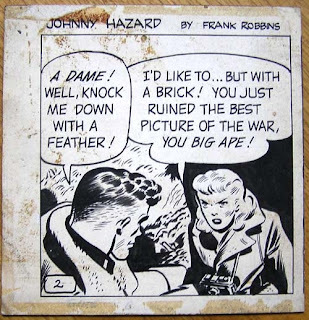 It features an alternative version of a scene talking place approximately a month into the run of the strip (July 7, 1944), where Hazard first meets beautiful photographer Brandy - a key moment in Hazard-ous history. The drawing style indicates that it's an exceptionally early example and the number "2" in the lower left corner that it's the second daily in a sequence. 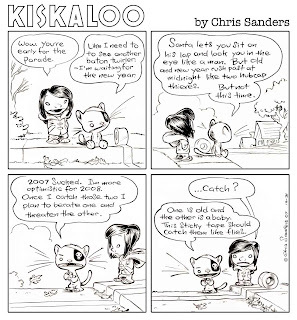 The first month of Hazard dailies presented an introductory airplane/air battle sequence establishing the strip and characters, but it's not until this scene with Brandy that Robbins began exploring the relationships and interplay between characters in the strip. This might therefore have been the first scene Robbins nailed down when he was planning his new feature." Now, what both I and Germund are wondering: are there more Robbins try-out panels around? Are there any sketches, unpublished strips etc. by Robbins surviving from this period? As we are on the Frank Robbins topic: Has anyone seen the paintings he did in Mexico after he retired? Or any of his paintings at all? What happened to all of his artworks after he passed away? If any members of the Robbins family reads this I'd love tho hear from you. It lost in the mail a few years ago. If you see this for sale, in your collection or at auction please don't hesitate to contact me. I'm actually still looking for a "new" Scorchy by him and a nice Hazard daily. How can I describe this cover? Maybe "Beautiful" is enough? Despite that this magazine has been torn and beaten the cover is still striking and just gorgeous. I havn't been able to find any info on the artist, "B. Tobey", so if any reader can point me in the right direction it would be much apprecciated. 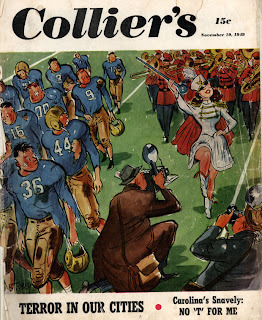 Got a similar cover by Russell Patterson somewhere in my archive. If I find it I'll post it here. The weekend is almost over and today I havn't done much. Just been working out, goofing off at the shopping mall, cleaning my drawing board and checking the net. It's time for "Random photo day"
Here's a nice x-mas gift I got from my friend Andrew Pepoy. 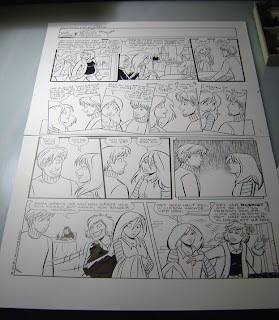 An original page from Katy Keene drawn by him. If you want to see more of his stuff or even buy your own piece of good girl art just follow the link to his site in the link list to the right. 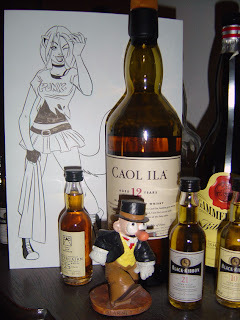 Then we have two photos that I took a few days ago when I went through my piles of original art. Some pieces are large and buried under other artwork. 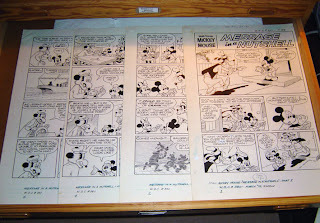 Like the four pages of Paul Murry artwork seen here. 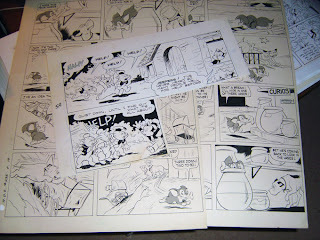 Or the two Scamp pages by Al Hubbard that's covered by some pigs in the photo below. Oink and woof! 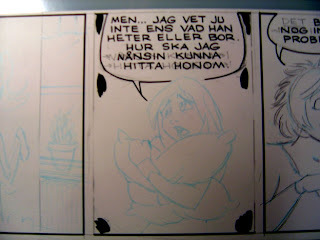 Below you see a panel in progress from an upcoming "Emma & Sara" episode. My cleanup in blue pencil from Hedvigs rough. Then the page that we finished today. Just the logo missing in this photo and some black to be added digitally. 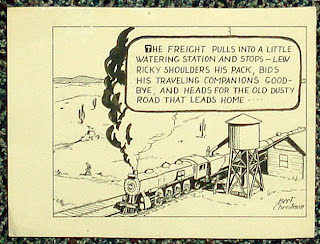 Ahh... having browsed through a pile of vintage Gottfredson dailies today, this is one of my favorites from 1943. This golf bag strip from January 16 shows how good he was at timing. Now I gotta get some sleep. Have work to do tomorrow. I was gonna blog about (and show some nifty samples of) Charles Raabs version of "The Adventures of Patsy" and how Caniff and Sickles both influenced him and helped him out + how bad it got in the end and how even worse it got when George Storm took over the strip. But my brain is way to muddy now. Got too little sleep last night. Watch for it later this week or next. And I'll try to illustrate it with plenty of rare samples. PS. Got my Li'l Bad Wolf panels today! Great stuff! A margin note says 5A so this must once have been the top half of page 5. 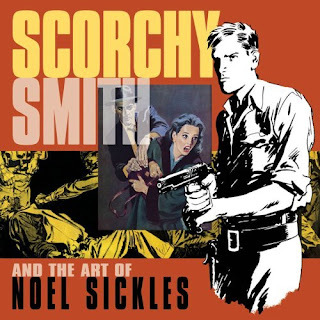 "Scorchy Smith and the art of Noel Sickles" now has a cover on Amazon! Me like! Time to dig in the drawers for some of my own stuff. It's always nice to hear people say nice things about your work. 1) Sigh... I'm so lonely and unhappy that I lose my fur. 2) Ha! Ha! Look at stupid. He loses his fur! 3)Ha! Ha! We'll build a boat out of it and sail over him. Yeah, thats what happends when you are lonely and unhappy! 4) Look he went... Into two pieces! 5) I kick one of them to Turkey. 6) And I eat the other one! 7) Look!!! You are puking money! 8) Swell! Then we can buy a bomb and blow up the earth! Horray! 9) The best Andres in the world! They like me! About the bottom tier: Herriman had a little extra gag on the bottom of his sunday pages in the later run of Krazy. So I decided to add one here too. 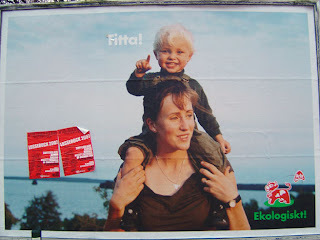 No translation needed here I guess. 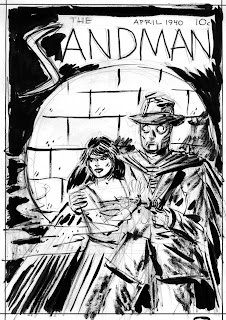 I was thinking about sending a copy to Art Spiegelman but I never got around to do so. If anyone is in touch with him feel free to tell him about it. I hope he won't sue me for using his Maus alter ego. His use of old characters was also an inspiration when I did this page. 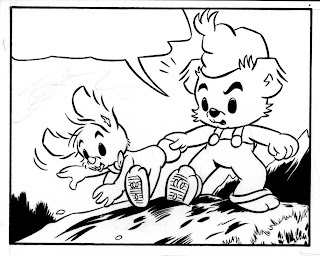 As you can see the two kids are "updated/mangafied" versions if the Katzenjammer Kids. One of the ideas with this page was to let old and new meet. 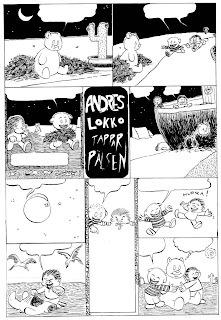 This page came into beeing when Gunnar Krantz, editor of "Seriekonst" asked me to do something for the tabloid. I really had no time and hesitated both once and twice. I really had no idea what to do. Then I remembered an old one page that I had begun in 1996 or 1997. I never finished it back then due my lack of knowing how to draw. Honestly, drawing is still an uphill battle for me but back then even more so. While I'm at it: here are a few drawings that I found next to the page above. 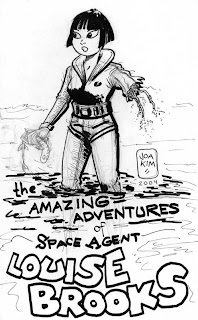 The Louise Brooks Space Agent drawing I remember doing at an airport in france just after the Angouleme convention in 2004. My thought must have been "Wouldn't it be cool if Louise Brooks was reanimated as a part robot part human and placed in the future space and..." Well just one of those would be ideas that never will get further than one drawing. The Bamse drawing was made a few years after I had stopped doing artwork for Bamse as a freelancer. Just to see if I still could draw him. But I knicked the layout from a Barks panel. Wich one? 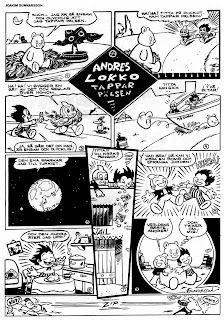 I've forgotten, but I think that it featured Donald and the nephews instead of Bamse and Lille Skutt. 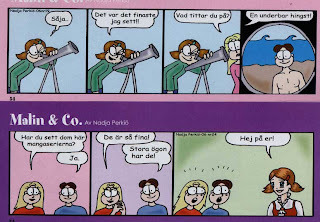 Unfortunately I don't have any translations, but for those of you who can read swedish I just wanted to show you this "unknown" comic strip. Unknown that is, if you're not a swedish girl between 8 and 13. Then you probably have read it before. I hope Nadja don't mind me showing a few samples here on the blog. Some of these really had me laughing my head off. Enjoy! One of the X-mas gifts I got this year was an empty calendar for 2008. Empty? Yes, and by the end of the year it will be filled with artwork. Why buy a calendar with pictures when you can do them yourself? :) So I and Hedvig will take turns in doing the monthly pics. Yes, I like Roy Nelson's artwork. Here are two items that recently secaped me on eBay. The second is a nice Cliff Sterret drawing. Went for a little too much for my budget. 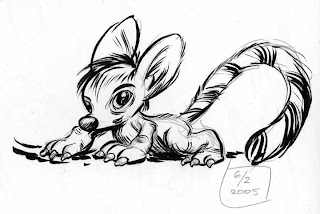 But it's such a beautiful li'l drawing I coluldn't resist putting it here for those of you who didn't see it.